Kelly's Electrical department has one of the largest selections of electrical products in north-central Washington. 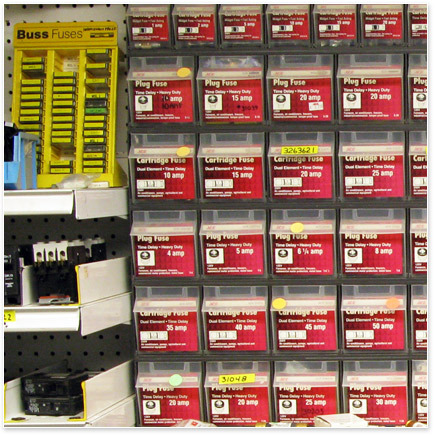 We have huge supplies of breakers and fuses including Square D QO and Homeline Series, Bryant, Cutler Hammer, General Electric, Zinsco, Federal Pacific Stab-Lok, Pushmatic, and more. We carry 1/2" through 2" EMT conduit and 1/2" through 3" PVC conduit and related fittings. We carry BX armor-wrapped cable, metal flex conduit, PVC and vinyl-coated liquid-tight conduit, Wiremold and cord duct, ballasts and fluorescent lighting parts, light fixtures and replacement sockets and shades, and combined experience of over 50 years! Click Here to view a video showing important Electrical Wiring safety advice.